As a social activist, social change is my main my goal. But social change cannot come unless we, as community members, claim ownership over all community affairs. Since the formation of panchayati [village councils], the government has introduced many plans for village development. Today, from cleaning the lanes to digging a community pond, there is a government scheme for everything. But the majority of villagers are unaware of these schemes. All they do is cast their vote and believe that the panchayat [village council] will take care of everything else. Let me give you the example of Kaudikasa, a village in my area. The groundwater in Kaudikasa has a high level of arsenic. As a result, many of the people in the village suffer from blisters on their hands and feet, chronic diarrhea and headaches. I have visited this village a few times. 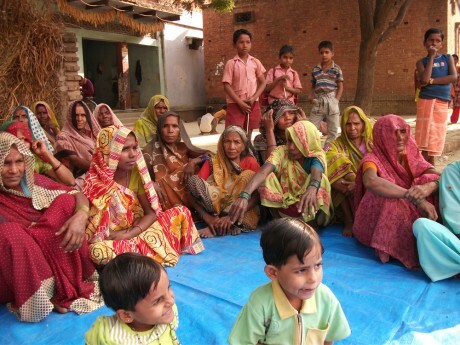 On learning of the arsenic problem, I asked the villagers if they had tried to find a solution. They replied: “The government doesn’t care.” But when I contacted the district health department, they told me that a water treatment plant had been set up outside the village and that water was being supplied to the village for everyone to use. However, Kaudikasa village is divided in two parts. On one side, which has electricity, water and a good road, live the upper caste people; on the other side of the village live low-caste Dalit people and tribal people. The drinking water pipeline has not reached this side of the village yet and people are dependent on bore wells, which contain arsenic. This, I think, is the biggest challenge of a social activist: the apathy of the community members to improve their own living conditions and claim their democratic rights. In 2009 I formed Jurmil Morcha – a people’s movement – in a village called Pangri, to confront this challenge. The ownership of Jurmil Morcha belongs to the village. Villagers meet every month and discuss everything related to the village: the problems, the schemes, what is working and what is not. The government is made of us and the welfare schemes – from sanitation to water supply – are carried by us because it is the villagers who are employed by the Panchayat. So if something is not working, it means some of us are not doing our work well. We have to correct those small faults. Change has to begin with us. I am now trying to see the same change in Kaudikasa and I am hopeful of making it happen. Bhan is fast becoming a heroine of mine. I love her unwavering determination to improve the world around her. Looking forward to the next blog! I must admit, I have been enjoying reading every blog by Bhan and reflecting on my own experience of living in the country. It is really admirable that way she is coming out with solutions to some of the trickiest problems in rural India! I received the link via Twitter and was first a little puzzled. I didn’t know why anyone would re-twit such a story.But once I started reading, I could not stop! What a simple, yet powerful, solution oriented write up! What’s more, whatever she is saying, is 1005 applicable to my country Kenya as well! Beautiful! It’s very nice to read about how an ordinary woman can come out with solutions that are so simple,yet so effective. I agree with Rob Safar: I am looking forward to the next blog already! What a simple,straight and practicable idea! I think this is what the world needs today – to engage community members in finding solutions to their day to day problems, because obviously the government can’t do everything. Also, as Bhan rightly says, who is the government but the community members themselves? A great thought indeed! Having read and thoroughly enjoyed all the blogs of Bhan Sahu so far, I am curious to know what she plans to do in coming days. A very simple but powerful comment on how to bring real change! I hope that reading these words of encouragement that Bhan and others like her will feel that others around the world are behind her and giving her moral support. Go for it, Bhan Sahu!